How would you rate the precision of your bookkeeping? How many mental calories does it take you to do your accounting & bookkeeping? Would you be able to spend that energy more effectively doing something within your gifting, strengths, or core focus? If you’re like most people that I meet trying to build a business or excel as a self-employed individual, it’s easy to get side-tracked doing unimportant things that don’t help build momentum. If you’re not moving forward in business, you’re probably moving backward. It’s critical for business owners to intimately understand their financials & monitor the numbers of their business – you NEED TO BE A NUMBERS PERSON! That’s why people enlist us to serve as their outsourced accountants, bookkeepers, & tax advisors. Nuance Tax & Accounting provides bookkeeping, accounting, and QuickBooks bookkeeping for small businesses, non-profits, and entrepreneurs. We have dozens of businesses that enlist us to keep their QuickBooks up to date all times, ensure their tax payments are taken care of, and provide helpful reports each month. When you’ve kept great records & your accounting is done to professional standards, the IRS or various auditors will see that you are organized, professional, and on top of your game. Sound accounting & bookkeeping, particularly with a professional, is a business owner’s number one defense against claims in an audit. Do you have the tools to measure monthly, quarterly, or annual fluctuations in profit, gross revenue, expenses & sales? Are your books accurate enough to provide you good financial statements as well as management reports? Here at Nuance Tax & Accounting, our QuickBooks service not only gives you accurate financial statements, but we can provide very clear management reports that help you easily understand the trends in your business without needing giant spreadsheets. We do this by utilizing Fathom HQ within our QuickBooks Online service. Bottom line – when your books are accurate you can actually lead your company. You should be doing everything in your power to maximize the efforts you invest into your business, and mitigating taxes is one of the most important ways to do that because TAXES ARE YOUR BIGGEST EXPENSE IN LIFE. When you have an accurate, up-to-date bookkeeping system, you can manage your tax planning more effectively. If your goal is to mitigate taxes so that you pay only your fair share and not a penny more, then you need pro-active tax planning. If you want to make sure your taxes are paid throughout the year in an accurate manner so that there are no surprises – then accounting is important. Nothing is more useful in tax planning than accurate & rigorous accounting with up-to-date QuickBooks or bookkeeping. Professional QuickBooks bookkeepers will make sure that every single qualified expense is booked & accounted for instantly. This means you wont get to the end of the year and be faced with the daunting task of remembering all the different expenses that should be applicable. Lets face it, even highly educated entrepreneurs can lack the competency & proficiency in bookkeeping that a professional accountant has. Professionals are wizards at ensuring that the chart of accounts, general ledger, and balance sheet will be setup correctly. Most importantly, things will be accounted for properly which leads to protection, efficiency, savings, and wisdom. 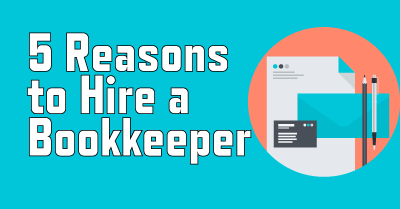 Rather than settling for mediocrity and doing things like an amateur, hire a professional bookkeeper that will lay a firm foundation to build your business on.